This blog post was written as part of my collaboration with eBay Thanks for supporting the brands that keep Nany’s Klozet going. There’s something about Spring and its warmer air that inspires us to start over- this blooming season leads us to makeovers of all kinds. Some people start renovation major projects in the backyard, and some people clean out their closet (especially to make space for fresher and newer things to come along, raise your hand shopaholics!). This is why I’m super excited to partner with eBay during its Spring Sale because you can find absolutely anything you need; from vacuum cleaners to home organization products, and everything in between. The eBay gift card is the perfect gift for absolutely anyone…especially those who are hard-to-shop-for people! Four years ago, I moved to a 1 bedroom 1 tiny closet apartment in Miami with my then-fiance-now-husband. I’m not going to lie: as the little girl of the house, I was also used to having my own closet and space…then add up the “fashion blogger” factor. 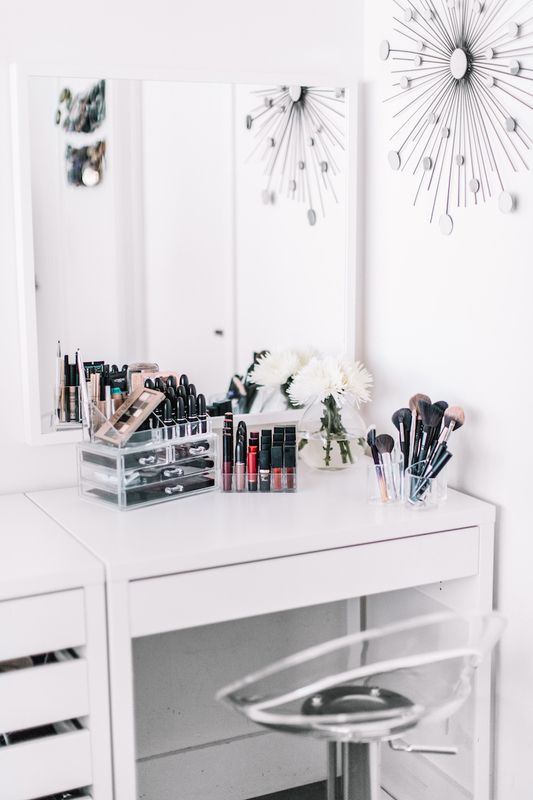 Over the years, I’ve learned some tips to maximize space, keep everything organized and achieve all your Spring Cleaning Goals. 1. Keep, Fix, Donate, Throw Away, and Sell. Have I worn it in the past year? Why haven’t I worn it? Is it damaged? Is it fixable? Does it still fit? Is it still on-trend? If the items are in good condition but have no significant value, donate them. If you think you can get a little money, sell them! Forget about sentimental value; it doesn’t make sense to keep the dress you wore to prom 10 years ago. Remember keeping an item isn’t what keeps the memory alive. I’ve been slowly transitioning to velvet hangers for many reasons. First of all, it gives a luxurious feel to your closet. Second, the ultra thin shape will let you put more items. FInally, the velvet helps clothes to not slip. During the eBay sale I got 50 hangers for under $20!! At this price, I might get a few more. Also, try this fun trick to know if you have worn something in the past year. Put your hangers backwards every time you do a clean-out; when you wear it, put it back as it should be hung normally. At the end of the year you can clearly see what you haven't worn in a while. We tend to forget that make-up has an inspiration date…and sometimes it’s expires faster than we expect! For example: eyeliner lasts from 6 months to a year, while mascara lasts 3-6 months. On the other hand: lipstick, powder cosmetics (blush, eyeshadow, setting powder) can last up to two years. Also consider that all natural makeup expires faster. If you are not sure how old a product is, smell it trust your senses. 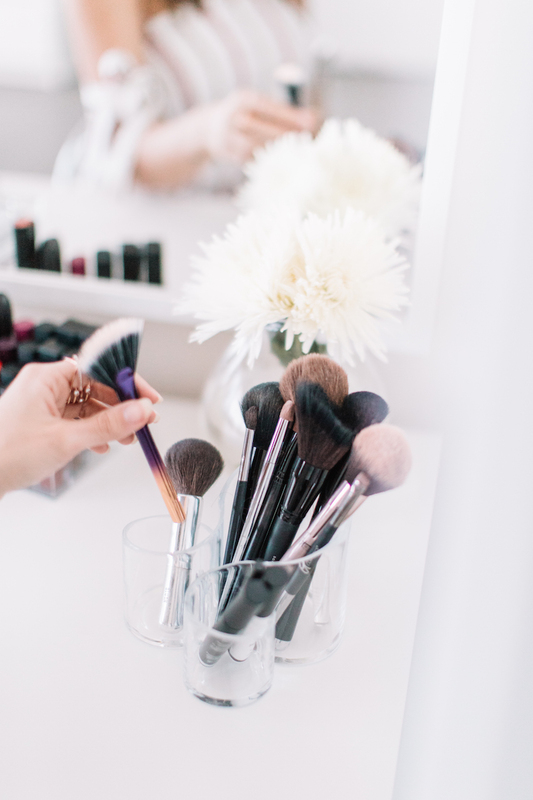 Wearing makeup that’s expired can cause breakouts and allergies. Try keeping what you really love and use frequently. Clean it and get ready to store it! 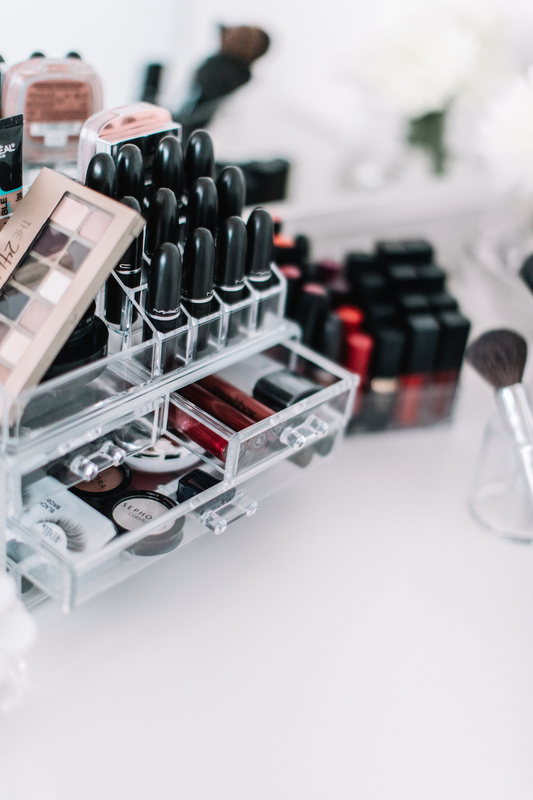 After cleaning up your makeup bag, think about what you wear on a regular basis, what you wear on special occasions…and now it’s time to keep it organized! 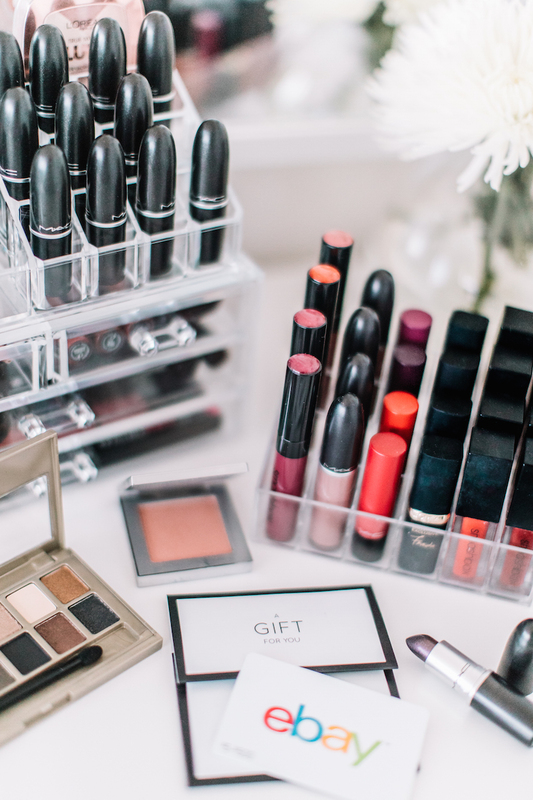 I absolutely love clear displays on my vanity. For my brushes, mascara, and liners, I got this Curved Acryling Organizer (for only $12!). You all know I’m a lipstick lover, so I got this 24 Lipstick Makeup Holder! I’ll make sure to keep my favorite shades at reach- that way I don’t forget them and continue wearing them. Finally, I keep everything by type in the Storage Clear Case. On the top shelf, I like putting my every day products; while on the little drawers I put special occasion products. People ask me frequently how I keep organized my clothes when it comes to shooting. When get a new item or something I want to shoot, I don’t instantly put it in the closet (because it gets lost…I’m sure sometimes you find clothes with new tags hidden in the back of your closet). That’s why I like using a clothing rack. There I keep seasonal items, new items, and I organize the looks for the blog. PLUS it gives me extra storage. My clothing rack recently broke after many years, so I decided to upgrade and I got a Collapsible Rack Hanger at ebay. The quality is amazing and I found it for $40, half the price I saw it in local stores! Ready for Spring Cleaning? Share your tips with us! I adore this post! It is definitely hard when you are used to your own space and that changes! 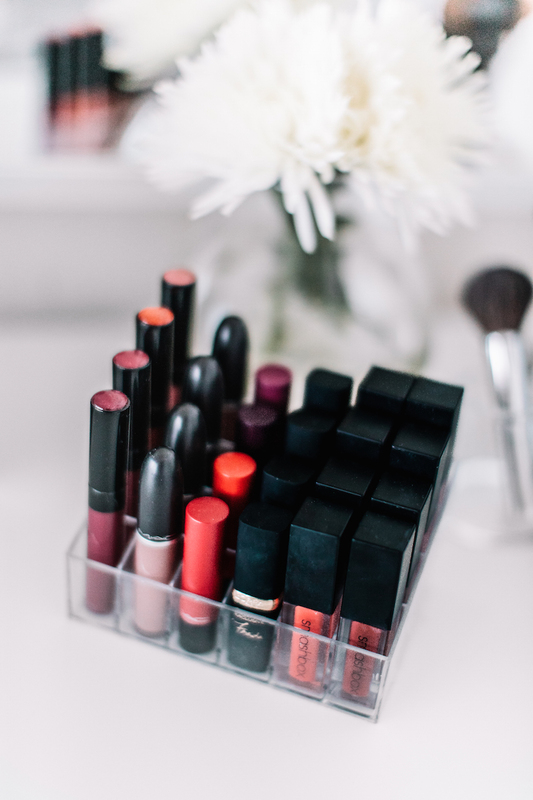 Such good tips, love the 24 lipstick holder and at $5 you can't go wrong! right! I can't believe it was only $5! I swear every spring and autumn that "I need to get everything organized" hits me hard. It is autumn here in Peru and last weekend I started to clean my room, and did exactly that. I separate clothes that I want to donate to the people affected for the floods here. Then I washed all my makeup brushes, I got rid of everything I didn't use anymore and so. And yessss those velvet hangers are the best!!! I bought some while I was in Florida last year and I brought them here (Lima) everyone always asks where I bought them. Gotta buy some makeup organizers to keep the products I use the most on sight. Justo mi familia estuvo en Peru esta semana...que belleza! I can't wait to go! I love that you are donating to the people affected <3 I always send boxes to my venezuelan people! I have to wash my brushes asap! It's so annoying!! RIGHT! and the house feels all light, like all bad energies went out the door! Justo estaba pensando en hacer limpieza de armario. Me iba a levantar justo ahora jajaja. Me gusta la idea de las perchas de terciopelo. Yo tengo varias así, y las voy cambiando poco a poco. Un saludo enorme! siii!! porque cambiar todo de uno es muy difícil, yo poco a poco he ido cambiado y de verdad que vale cada centavo! !